The client performance tracking worksheet is one of the more fun personal trainer forms. It tracks how well your client is doing over time. It is a key measurement of your client's improvement. You should customize your personal trainer forms for each client. In the old days this was a lot of work. 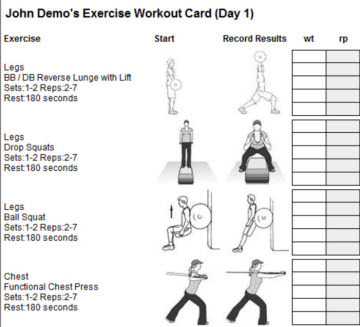 But now with our Complete Training System, the client workout cards are generated automatically for your clients. The image to the right is a good example of a simple workout card that can be loaded on a phone or printed. And even better, your clients can enter their results online even when they are not training with you. That means better information for you, and better progress tracking for your client. Building the workout card online is as simple as identifying the exercises that are relevant to your client. If you are working with a competitive weight lifter, they will have a very different list of exercise compared to one of your senior citizen clients. The Complete Training System has templates for common workouts which you can further tailor for each client. You can even create your own templates of your favorite workout programs which makes ongoing program design and maintenance much quicker. How do I use the Client Tracking Worksheet? It is one of the easier personal trainer forms to master. You should periodically record the weight and number of repetitions that your client did on that date. Use a new column for each date. Remember that you don't have to fill in business forms on every session. Clients don't progress that fast. But remember to take measurements on your second session (you need to be gentle on the first session) and then on a monthly basis thereafter. But if you encourage your clients to complete the form each time and enter their data online, they will be able to monitor their performance on their dashboard. This is one of the "Client Saver" personal trainer forms. Whenever a client has a down day or seems frustrated about their progress. I take out the form and review the facts. The numbers don't lie. Over time your client should be able to handle more weight or at least do more reps. Its a good way to justify all the money that the client is paying you! 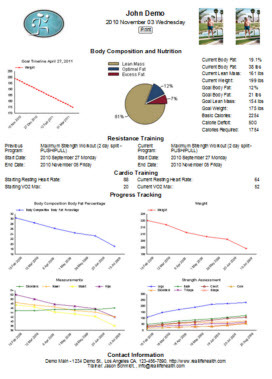 This is even easier with the Complete Training Systems Progress Tracking Dashboards (see image). All the data is tracked for you and your client. All the key metrics including strength, flexibility, body fat, weight, VO2 Max, and calories are tracked adding a ton of value for your client. Where do I get these personal trainer forms? You can get our FREE personal training starter kit which includes copies of all the basic paper forms by signing up for our newsletter (you can unsubscribe at any time). To take your business to the next level, you can automate the whole process with the Complete Training System.